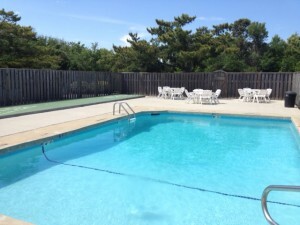 Located just past the bend in the road as you enter Duck, NC and after climbing the hill to the top of Scarborough Lane, sits the Sea Pines community, formerly known as Ocean Beach Campground. The community runs all of the way to the ocean among a landscape of sandy hills and native pines. You can keep yourself busy at the community pool and tennis court or try your skills on the poolside shuffleboard court.